In the Rice Creek Preserve behind my home, Sedge Wrens nest every spring in the grassy field along Baldwin Lake. They are active birds, and call regularly. Often, I can get my scope on one, and hack out quick sketches of its poses. Then I watch for color and markings. 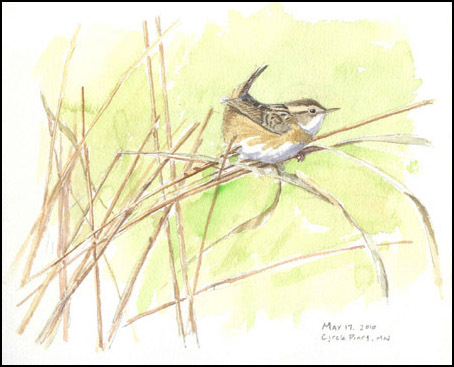 I like the attitude of the bird in this sketch, it "feels" like the wren I was watching.